At NGI, we believe birthdays are a thing to be celebrated! For a small office here in Boston, we’ve had lots of birthdays in the past couple months. 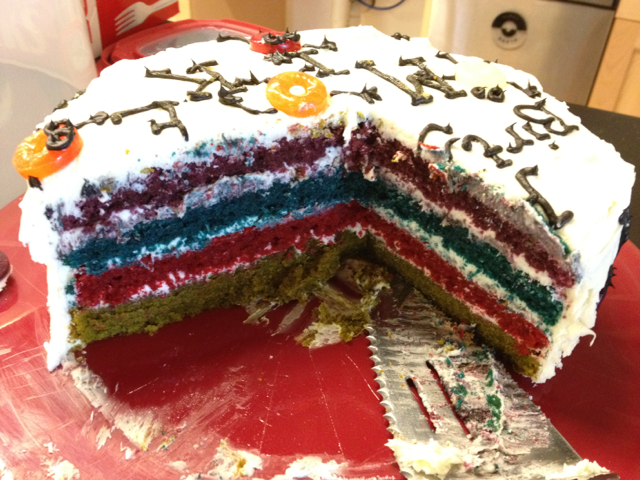 One of the best parts of birthdays in the office are the delicious cakes our celebrations center around. Lately, our very own Customer Advocacy Coordinator, Ceysa, has taken on the cake challenge and has been baking up delicious and beautiful cakes for our office birthdays. If you follow us on Twitter or Instagram or Like us on Facebook, then you’ve seen her incredible creations! Ceysa’s talents are not lost on us! Her beautiful cakes and cupcakes are just as good as they look. Ceysa goes above and beyond to make sure her creations are truly customized to their recipient – she snoops around in the days before in order to get the flavors and gorgeous decorating perfect. And though my birthday has yet to come around, Ceysa has even taken into account my challenging allergy, and has started making her cakes gluten-free so that everyone in the office can enjoy her creations. Amazing! NGI: When did you start baking? Ceysa: I would say the first cake that I was proud of happened a year ago in February. I actually started for the decorating, it was fun and a good creative outlet. More recently I’ve started to play with homemade recipes. NGI: What do you love about baking? I love baking for lots of reasons – it’s relaxing, it’s creative, it’s fun to try new things and challenge myself, and most of all I like seeing other people enjoy the final product! NGI: What is your favorite kind of cake? Ceysa: I don’t know that I have a favorite kind… I don’t typically like things that are super sweet, but I will enjoy a few bites of red velvet or chocolate. My favorite flavor combo is probably mini dark chocolate cupcakes with creamcheese frosting and a fresh raspberry on top. NGI: How do you choose what kind of cake to make for someone? This post would not be complete without showing off some of the amazing cakes Ceysa has made for us, so here they are! For Mary’s birthday, Ceysa made these Strawberry Cupcakes: Mini vanilla cupcakes with a strawberry filling, topped with vanilla icing and a fresh strawberry. To celebrate Bonnie’s birthday, she created this Classy Birthday Cake: Gluten-Free chocolate layer cake with a raspberry filling and cream cheese icing. Today’s birthday creation is Mike’s Little-LifeSaver-Dude Cake: Gluten Free 4 layer rainbow velvet cake with vanilla frosting and cool dudes. Of course, this post would not be complete without a birthday shout out to the other better half of Team Do Stuff, Mike! Happy birthday from all of us!